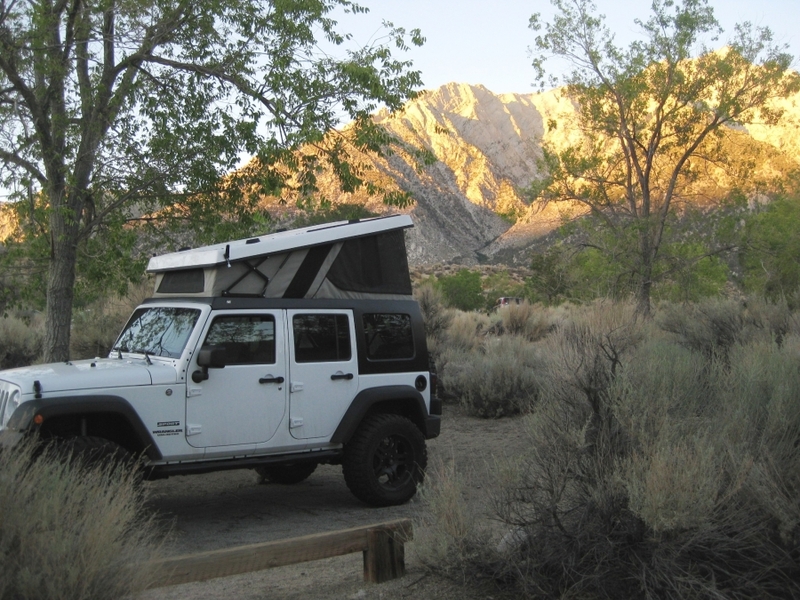 I thought I'd post some pics specifically under this title for those interested in a tent top for their JK, and they would not have looked at the other thread where I posted these pics. I looked at the Habitat and rooftop tent, but decided to go with the Ursa Minor J30 top...Here are some pics from my trip home from picking it up in San Diego. I think this company builds really good conversions, which look almost OE. Looks nice, would also like interior pictures. 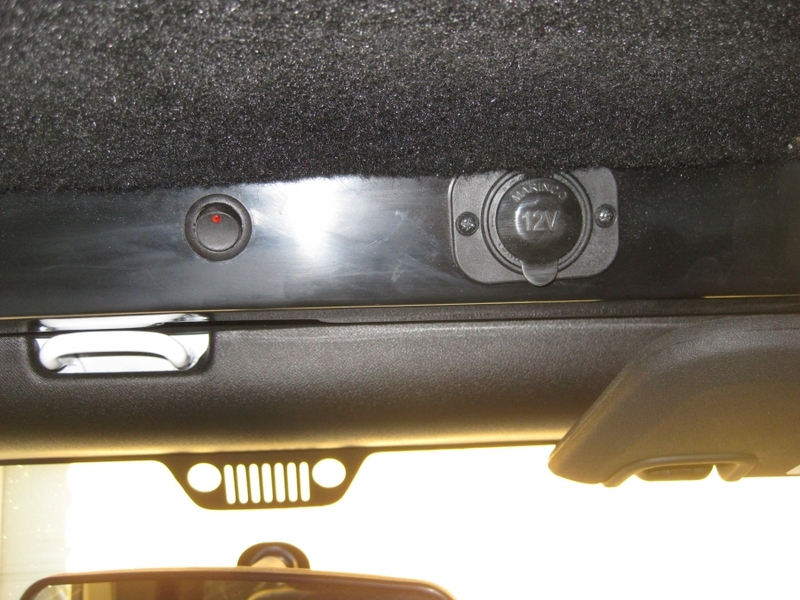 Is access through the inside of the Jeep? Or by ladder from the outside? Can you give us details on the sleeping area please? How thick/comfortable is the mattress? 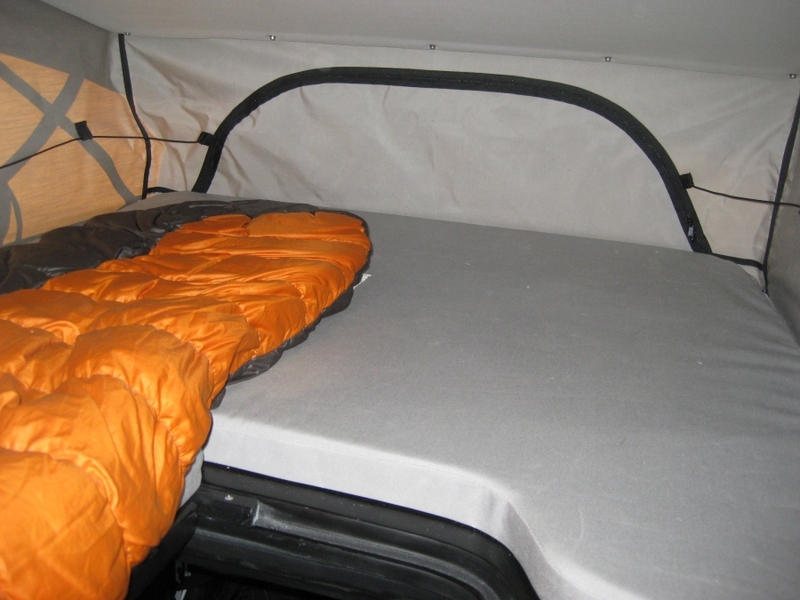 Can you leave pillows and bedding up there when the roof is"down"? Thanks for posting these. 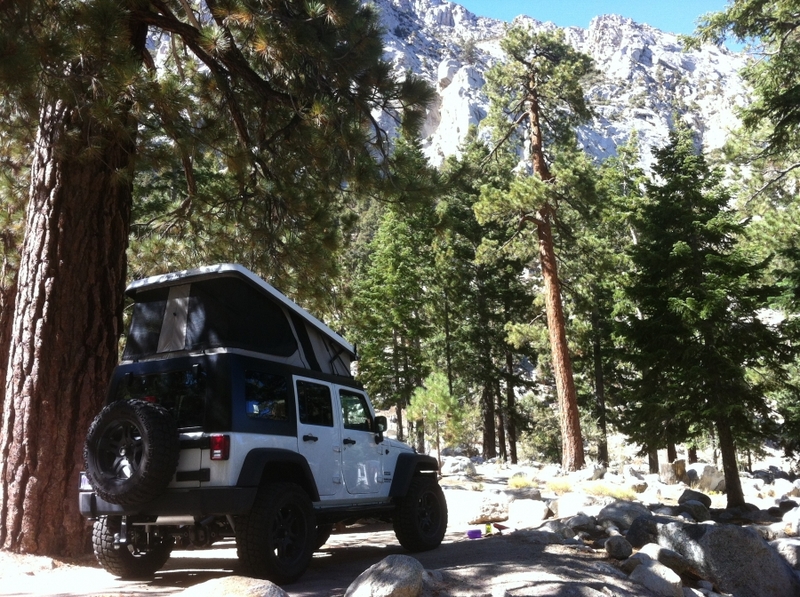 I wasn't sure there was even a unit that was in the field besides the one on the UMV JKU. 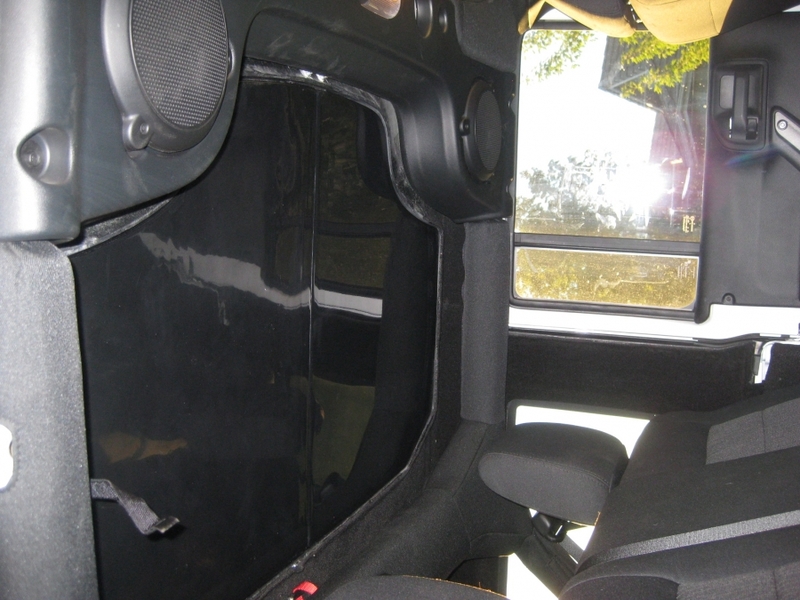 Please do post more interior pics plus some reports on ease of entry and putting the hatch in place, raising/lowering top, etc. That's the really important stuff we want to know more about. Looks really nice!!! Here is one side removed. The interior is enough for two adults, and I think my dog would fit as well. Length is reported at 7 feet, but I have not measured. Of note, the canvas is a little more taught than in the picture, but I had not extended it all the way when I took the picture. 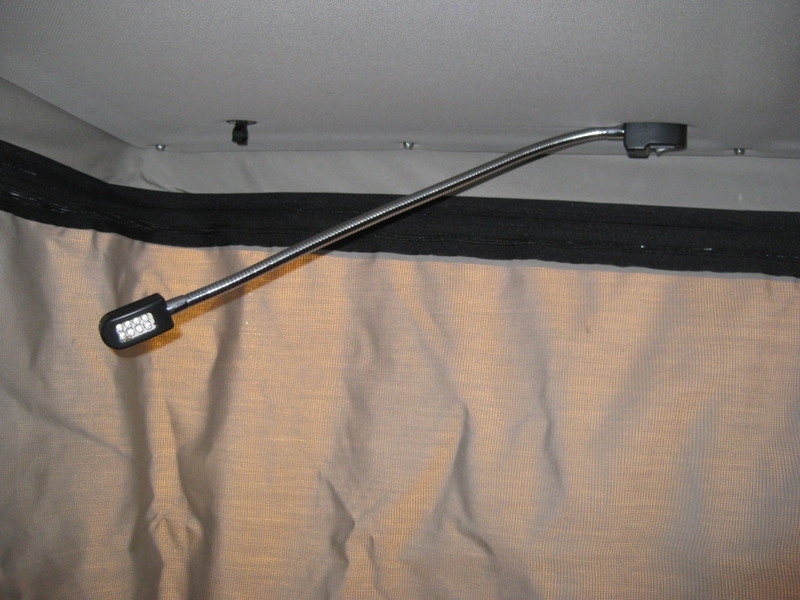 There are two LED lights - one for each sleeper - on flexible metal tubes, and one center interior light. They clip up out of the way when not in use. 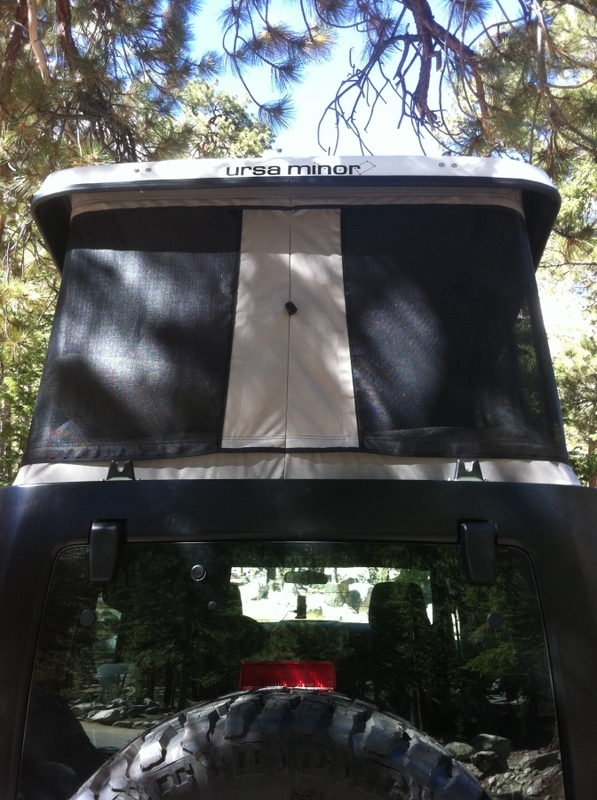 Both sides unzip to the center with bug mesh, or you can completely unzip each side so you could climb out this way, let in more breeze/enjoy the weather, or grab something off a shelf/tray mounted on the back. I have some lightweight down bags that crush pretty small. I would keep them toward the center as to not interfere with the canvas as it comes down. I would think a down pillow might also work, but, again, placed as to not interfere with the canvas. The pads were good, and I slept fine, but I put down a lightweight backpacker inflatable mattress with a small amount of air, and it was close to my bed at home. As I put in the other post, two adults would be fine. The addition of my dog might cramp it a little, but still would work. Anyone who has closed a VW Westy, or seen it done, would know exactly how easy it is to close/open. About a minute, or less, and most of that is just making sure the latches are undone and a door or two are open so air can get in so you don't have that "vaccum" effect. Entry takes some trial and error depending on your build/height. I'm 5'10", and the opening hits me around the upper waist. 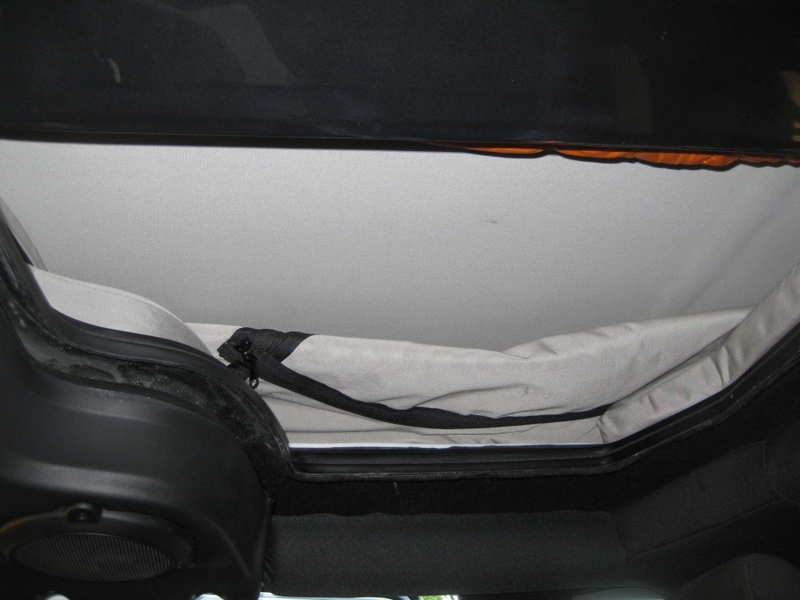 I have a small folding step I can use to get me a little more "up" (but I don't really need it), then go up in a sitting position, pull my legs up and pull the hatch closed. faster the more times I did it. Closing took a little more time just because I was making sure the canvas was in and out of the way of the mechanism in front, but it only added a minute or so to the time. So do you move a part of the sleep pad out of the way to get in & out of the top? If someone is sleeping how hard is it for the other person to get in & out? You know like when the wife needs to take a potty break in the middle of the night? Looks great and I really like that this product is on the market and in the outdoors...in a pretty quick amount of time since the project started. Great work and keep us posted on your thoughts over time. 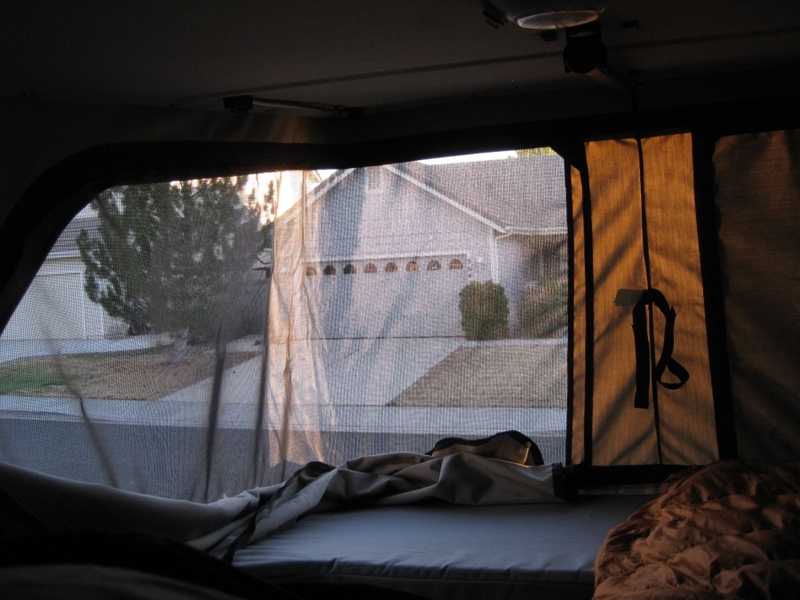 It looks like the half panels are designed so that one person can transit up/down while the other sleeps. 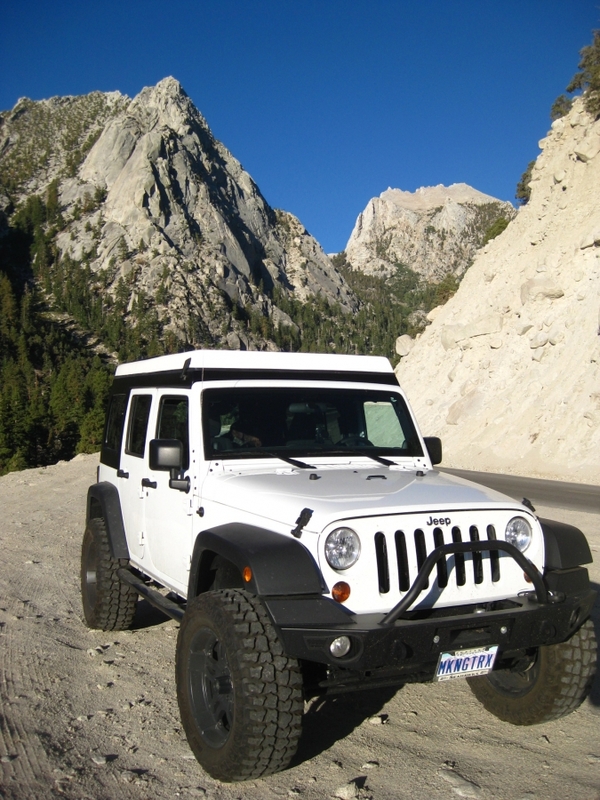 Here's the web page for the Jeeps. Yes. 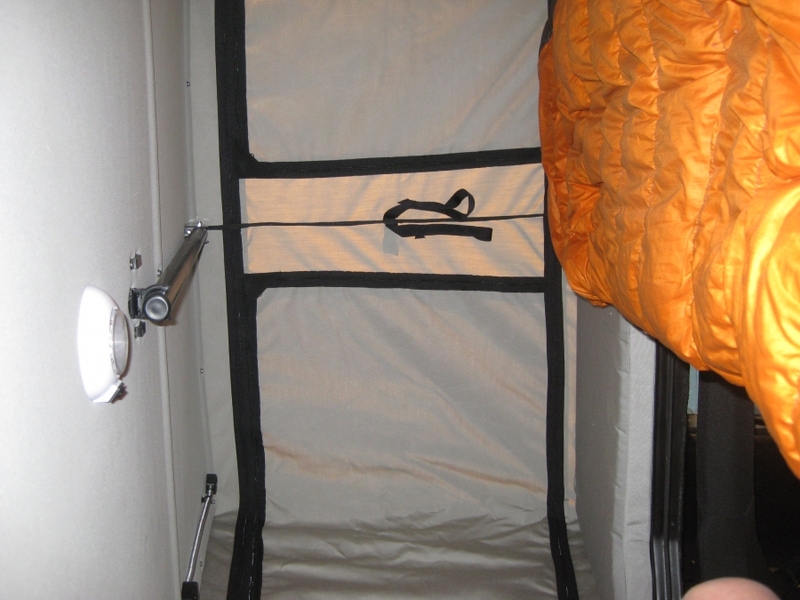 The entry point is two individual solid hatches, with the mattress having the same two hatch pads. 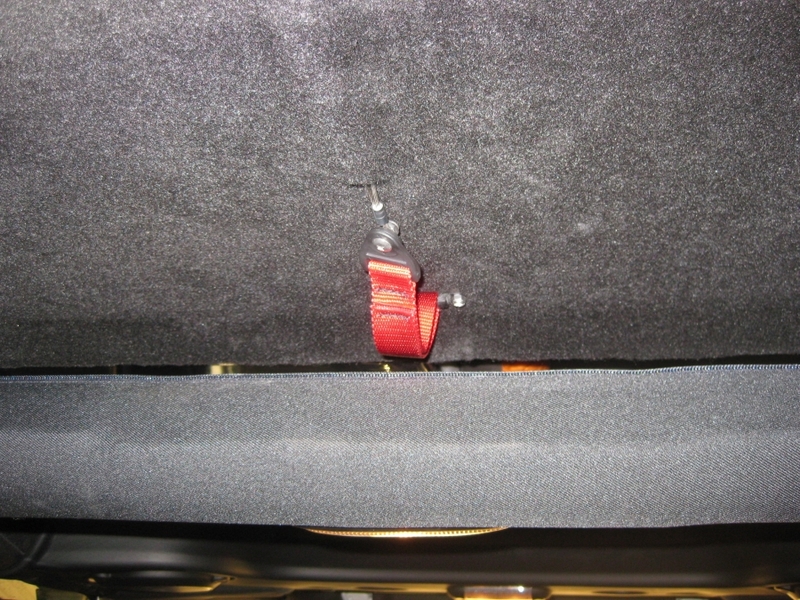 You pull the pad out and the solid hatch pivots (or you can pull it all the way out) and there is a strap that you can secure to a hook on the top so it doesn't drop. You then drop down without having to disturb your partner. It's kind of a trial and error thing, but the more you do it the easier it seems. Of course everything comes at a price. It was mid 5K with tax. 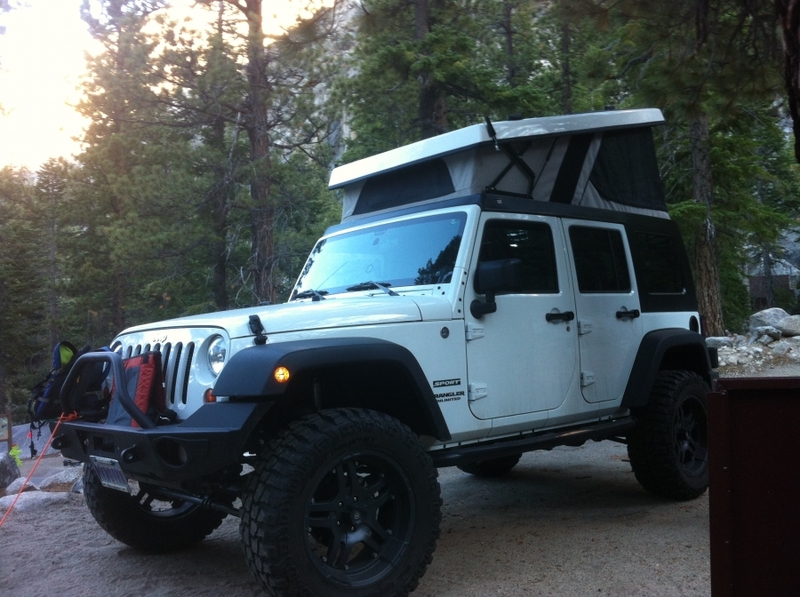 Certainly more than a rooftop tent, but all things considered not bad. A new three piece top is around 3K, so an additional 2K is not bad for what you get. 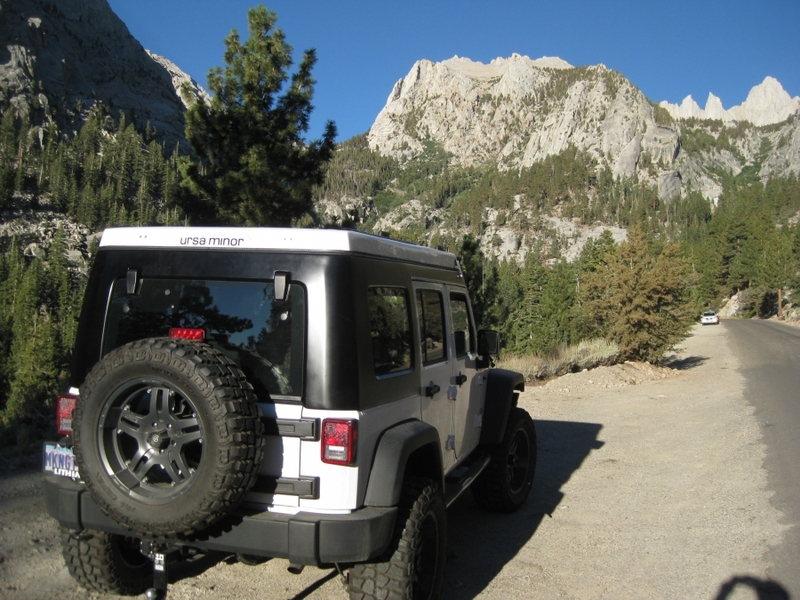 The JK Habitat is mid 7K with tax, and the Maggiolina tops range between 3K to almost 6K with tax. I figure a few dozen nights where I can just pull over and sleep w/o having to get an overpriced motel room (when I don't have my trailer), and the top will have about paid for itself. Is the bar clipped to the ceiling (just behind the center lamp) a prop that would prevent the top from closing? If so it is a great idea. If you had a heavy load on the roof (more than usual for the spec of the gas struts) then the prop would eliminate any potential sagging. It also seems it would be possible to circumvent the hatches by simply climbing up the spare tire and going in through the rear windows instead.